I had several people email me asking for the recipe for the granola bars that I pictured in my menu plan. I had planned on posting this in a week or two, but since you requested it, I decided to go ahead and post it now. I hope you enjoy! My kids love granola bars, but it does not take long for a box of granola bars to disappear with three kids in the house. I have been trying for a long time to find a homemade granola bar that we liked. I knew I could make a homemade version that was cheaper and better for you than the store bought versions. I have tried many recipes and some were good, but none were great. I tried some recipes that were very healthy, but tasted terrible. I have made some that were so dry they fell apart. Others were so sticky that they were hard to eat. A few recipes were so sweet that they tasted more like a dessert than a snack or breakfast item. I wanted a healthy and good homemade granola bar. I kept tweaking and trying recipes determined to find one that we liked and that was at least semi healthy. Recently, I finally developed a recipe that we liked. In fact, we liked this so much that I made them three times last week. These are a perfect blend of crunchy, yet soft and chewy. These really are a cross between a soft and a hard granola bar. I think they are the best of both. Now, I know that these are not the healthiest granola bars, but they are healthier than what I can buy. I know what is in these and I can control what goes into them. And yes I know they have a little corn syrup in them, but that is what helps give them the great texture that they have, and I figure it is not much. One tip is to follow the directions on cutting and removing these from the pan. It will make them much easier to remove from the pan. Grease and 8×8 pan. In a pan combine the butter, brown sugar, honey, and corn syrup. Stir constantly over medium heat until butter melts, sugar dissolves, and mixture is smooth. Remove from heat and add oats. Stir well until oats are well coated. 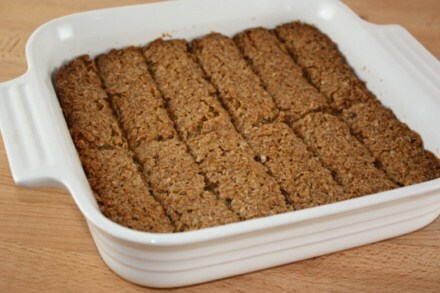 Spread mixture into 8×8 or similar pan. Bake at 350 for 22 minutes. Cool 5 minutes and cut into bars. Cool for about 1 hour more in the pan and then remove bars from the pan. If you wait to cut and remove the bars from the pan until the pan is completely cooled, the bars will be very hard to remove. or for something even healthier, add a few raisins, when you stir in the oats. .-= Amy @ Amy Loves It!´s last blog ..Tator Tot Casserole =-. … look really yummy! And I do love really yummy things, ha! .-= Maya´s last blog ..Baking a Birthday Fish Cake =-. Thank you! We just made homemade granola for the first time last week and were discussing how we would make it into bars! So many times you see granola bar recipes that are hard and have a lot of ingredients. These look simple and yummy. I’m making these tomorrow! My husband, my oldest son and myself just love granola bars. I AM going to try these! Have you tried adding peanut butter to them? I just might try it! .-= Harley Mom @ Loving Almost Every Moment´s last blog ..The Change =-. @Harley Mom @ Loving Almost Every Moment, I think peanut butter would be great. I would probably cut back a little on the butter though if you add peanut butter. Let me know if you try them and what you think. @Lynn, I was just thinking I can throw in peanut butter chips instead of chocolate. .-= Elaine´s last blog ..Rainbow Cookie Repost =-. @Elaine, Let me know what you think if you try them. I would love to hear what others think. These just came out of the oven. I couldn’t wait until they were cool to have a taste. 🙂 I added dried cranberries and chopped walnuts. These are terrific. @Bonnie, I am so glad that you liked them! I thought of adding the dried cranberries, but had not tried it yet. I am glad to hear that they work well also. We’re not huge on granola bars in our house, but I’ve always wanted to try to make my own. Adding this to my list! .-= Jennifer Y.´s last blog ..Reuben Appetizers =-. Yum! I’m definitely going to make these. My son will be so happy! .-= Lisa @ Stop and Smell the Chocolates´s last blog ..Etsy Giveaway ~ Designed by RJ =-. I stopped by from Tasty Tuesday. These granola bars look wonderful. I just discovered today that my boys don’t like oatmeal. Maybe I’ll try the granola bars sometime anyway. My kids aren’t used to granola bars- they are hard to find w/out a nut warning on the food label. Anyway, I just wanted to comment because they look tasty. I also read your Gluten Free story and although our struggles with food are very different, I understand how frustrating it can be. .-= Jane Anne´s last blog ..Monster Cookies (without the scary peanut butter) =-. Great idea! I don’t like using corn syrup though – do you have another suggestion for a similar effect? @Alison @ Hospitality Haven, I have tried many granola bars and this was by far the best. This was also the only granola bar that I have used corn syrup in. I think in order to get the texture the I wanted it needed the corn syrup. You might try something else, but I don’t think it will quite the same. I just made 2 batches of this recipe. The first one stuck to the pan but were still good. The second batch I made was a double batch. Instead of putting 1 cup of butter, I put 1/2 butter and 1/2 peanut butter. They are awesome!! This is totally going to be a go-to snack not just for the soccer team but for my family as well! Thanks soooo much! .-= Christy´s last blog ..Arm & Hammer Coupons =-. I’m going to try this recipe with some subs- coconut oil for the butter (nothing against butter, but kids can’t do dairy!) and ???? for the corn syrup (there has to be something close…). I’ll let you know how it works out. I, too, have been on a quest for the perfect granola bar recipe, but my experimenting hasn’t been that successful. .-= Brandis´s last blog ..Making the transition from paper to cloth- you can do it! =-. @Brandis, I actually tried a batch of these with coconut oil to try and make them healthier, they were good, but seemed greasy to my family. I have not cooked enough with coconut oil to know if this is normal or not. I might suggest cutting back the fat a little if you use coconut oil. But let me know what you find that works. If you find something that really works the same as corn syrup let me know. With all our food issues, we eat very few packaged things or items that contain corn syrup, so for my family I am fine with this little amount. However, I know many people will not use it at all, so let me know if you find something that works instead of it. .-= SnoWhite´s last blog ..Veggie Omelets =-. .-= Sherry´s last blog ..Shamrock Shakes and Minty Chip Cheesecake =-. Wow, what an easy and delicious looking recipe! I would always rather make things like this myself – thanks for sharing @ Tasty Tuesday! Wow–lots of comments on this one! No wonder, it’s a great idea and I can’t wait to try making them. My past attempts have been failures but I won’t give up! .-= Veronica M.´s last blog ..Best Made Plans & 10 Dozen Cupcakes =-. 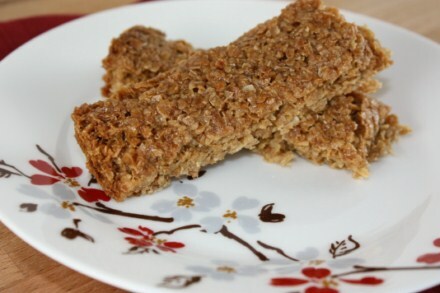 I just discovered your blog & am in love with these granola bars! I made 2 batches 4 days ago & they are gone. I’m actually in the process of making another batch (just have 10 more minutes of baking left!). The first batch was this recipe straight up except I didn’t have any honey. I substituted some pure maple syrup and they were delicious! In the 2nd batch (still no honey- I used the syrup again), I added about 1/3 a bag of chocolate chips. They melted quickly so I had chocolate ones. Everyone raved about them! In the batch I’m baking now, I added an all-natural trail mix of dates, raisins, peanuts, sunflower seeds, and soy nuts. I can’t wait to try them! Thanks for sharing this recipe. @Ellie W., I am so glad that you are enjoying this recipe. I love this recipe because of how much you can change it up and make it different. It sounds like you are making some great versions of it. I just made these…they are delicious! My 2 year old LOVES them. I added slivered almonds, cinnamon, and mashed banana. Thanks for all of your great recipes. I love your site! My kids just made these granola bars. They love them better than the Quaker granola bars we have on hand. I would say they are very sweet. A little too sweet for my taste but the kids love them. @JulieJ, I am so glad that your kids enjoyed these. I am making some this afternoon and my kids can’t wait. My 12 year old daughter is making a batch of these right now. We’ll have them for breakfast (unless we snack on them first!) I might make a peanut butter batch next. Thanks for sharing the recipe! .-= Mommaofmany´s last blog ..Creamy Italian Dressing =-. These are a little bit too good! I topped it off with a layer of chocolate almond bark. Made it with dried cranberries & mini chocolate chips. Thanks for helping me save money with items I already have in my pantry. I’ve been meaning to make these since the day you posted it and finally got around to it today! We’ve been buying granola bars from the store and go through two boxes a week to the tune of about $3 a box. I figure making them at home will save us quite a bit of money in the long-run! These are really good. I just made them plain but next time will try chocolate chip and I’m wondering if I can use peanut butter in place of some/all the butter. What do you think? Ever tried something like that? @Veronica Miller, I think replacing 1/2 the fat with Peanut Butter would work well. There are lots of different variations that you can do to these. We have not tried one yet that we did not like. These look great! 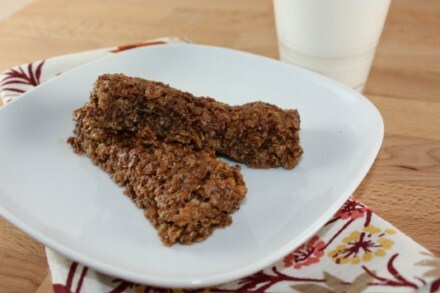 They are very similar to one I created for my kids, but my kids call them flapjacks instead of granola bars. The difference in mine is I used egg white instead of corn syrup, and I think, looking at the pictures, I got the same texture from it. I tried making these and I’m having a really hard time with them and I don’t know what I’m doing wrong! They are crumbling to pieces when I try to get them out. What we ate of it was delicious though but what am I doing wrong that they are not staying together? @Lauren, I am guessing it has to do with how long you are cooking them. If they are soft and crumbly I would say bake a few minutes longer. If they are too hard and falling apart, try a little less. And taking them out of the pan at the right time helps too. You want them not quite cooled all the way. I hope that helps. Oh my Gosh…I love this recipe. I made last night and fell in love with them. I will be making these from now on. Thank you so much for sharing a great recipe. I made these today and they are yummy! My son really likes them, too. I added a few chocolate chips to ours. I sprinkled some on the top which helped with them not melting and becoming chocolate granola bars. I hope to try this out for our upcoming vacation. Do these store well? @Sweet Tea & Buttermilk, Well they do not usually last long in my house with 3 kids. 🙂 But yes I think they would store for several days just fine. You might want to individual wrap them in plastic wrap to keep them a little fresher, but I think you will be fine. I hope you enjoy them. My kids loved the Granola Bars, along with them i liked it too. My son is fond of chocolate so I also added chocolate chips to it, it was good. I prepared soon after reading and I am glad I didn’t spoil it . It tasted really good just as it depicts in the images displayed. Would old-fashioned oats work in place of quick-cook? @Susan, I have never tried it. I think it might change the texture some, but I think it is worth trying to see how it would work. If you try it, I would love to hear how it turns out. these are great! i made them this evening. 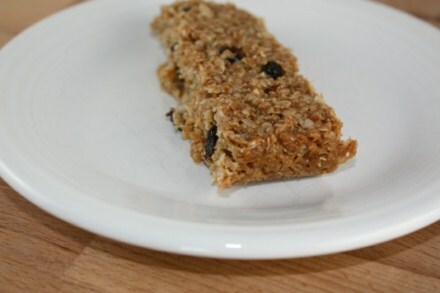 like a “real” granola bar…lovely, chewy, texture. i sprinkled in some chocolate chips, just enough to add a little flavor. i also added some vanilla to the butter mixture. I’m thinking I could even reduce the butter to 1/3 cup. Next time plan to try dried cranberries, maybe almonds, some flax seed etc! thanks for sharing! @Rebecca Kipe, Thank you! I am glad that you enjoyed them. There are so many variations that you can do with these. That is why I love them so much!. My kids are allergic to corn, so I am wondering if anyone ever got back to you about a good substitute for it in this recipe. Or did you find a second-best favorite that didn’t include corn syrup? Every recipe I find calls for it. I am glad you found my site and are enjoying the recipes. I think you could probably tweak this some and leave out the corn syrup, it might just take some time to get the right texture. Made these this weekend and they are SO yummy! Thank you for such a simple and tasty recipe. Lynn, can these be stored? Any idea how long? Do you think they would need to be refrigerated? Frozen? We have 6 kids and I know I’ll have to make a couple of batches at once. I’d like to make extra to stash for another day. Thoughts? I usually just store these on the counter and they have lasted 4 or so days. I have never refrigerated them, but that might help them last longer. I hope that helps. Lynn, I made 2 batches…1 like your basic recipe and the 2nd with Craisins stirred in the pot while the butter was melting (they plumped), substituting 1/4 cup PB for 1/4 cup butter and then sprinkles once they were pressed into the pan. The kids loved them! Even our 14yo. But with 6 kids I’m going to definitely have to double it! Thanks so much for sharing the post again! We love these. I just leave out the corn syrup and add about 1 and a half tablespoons pure maple syrup. My 5 year old takes them to school for snack time ( with craisins and almonds). I would love to hear what you think using all honey. I hope you enjoy them. They are out of the oven and smell delicious. They are crumbly but I expected that using all honey. They taste good but are a little sweet for me. They will not go the waste though. They will be great on ice cream, yogurt or just sprinkled on top of regular oatmeal. Think I will add some toasted nuts to it. Thanks for the recipe. UPDATE: I jumped the gun. After they cool they stick together nicely. Good I am glad they worked! I almost forgot I also added about a teaspoon of cinnamon. I have a post coming up in my allergy section about this because a lot of people don’t like the corn syrup. I am doing some experimenting and will share what I have been doing soon. Thanks, Lynn. I will be so happy to see what you come up with! Happy Sunday! So glad I found this recipe it was super easy and they look great so far, I’m just waiting for them to cool and I also added raisins and pecans…thanks! !